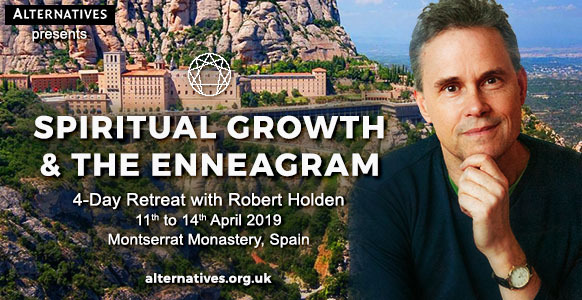 Spiritual Growth and the Enneagram: Spain Retreat | Robert Holden, Ph.D.
Join me on a 4-Day retreat with Alternatives in the beautiful Montserrat Monastery in Catalonia Spain – diving deep into the timeless wisdom of the Enneagram to help you experience practical growth and transformation in your life. Over four days, I will guide you on the nine soul journeys of the Enneagram. I will coach you on the basic anatomy of the nine personality types of the Enneagram – the helper, achiever, perfectionist, peacemaker, etc. I will also lead you on a soul meditation for each of the nine points of the Enneagram. At the Montserrat Monastery – one of the most inspiring places on earth – I will draw on teachings from the wisdom traditions, mysticism, poetry, works of literature, sacred art and Hollywood (!) to bring the Enneagram alive and help you use it practically in your life.